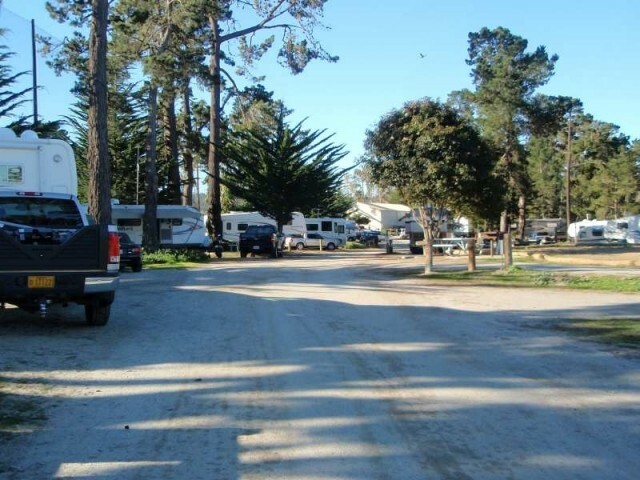 Monterey Pines RV Campground is located at the corner of Fairgrounds Road and Garden Road in Monterey. HEADING SOUTH on HWY 1, exit at Casa Verde Way and turn left. Continue through the light to Fairgrounds Road and turn right (West) and proceed to Garden Rd (signal). Turn left (South toward airport) and immediately look for the RV park/golf course entrance on the left (1st driveway entrance on left). ---- HEADING WEST from Salinas to Monterey on HWY 68, take Olmstead Road (right) and turn left on Garden Road. 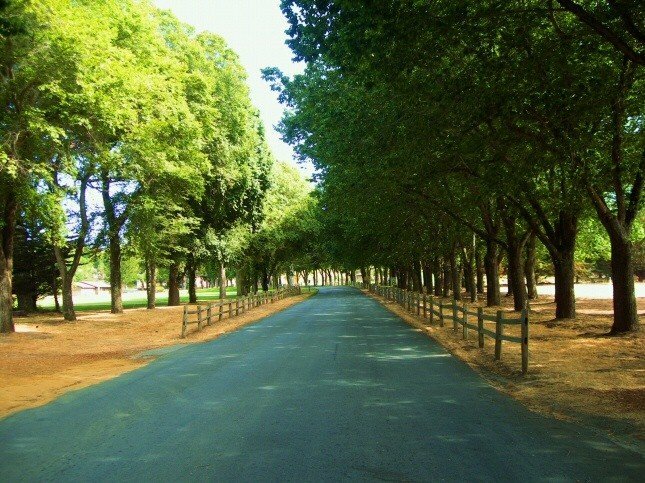 The entrance will be on the right (about a 180 degree turn) at the corner just before the light at Fairgrounds Road. ---- Check-in at the Golf Clubhouse. Active, National Guard, Reservists, Retired, 100% DAV, DoD/NAF Civilians, Guests. Accepted. Highly Recommended. Active can reserve up to 4 months in advance, Retirees,DOD/others can reserve 2 months in advance. 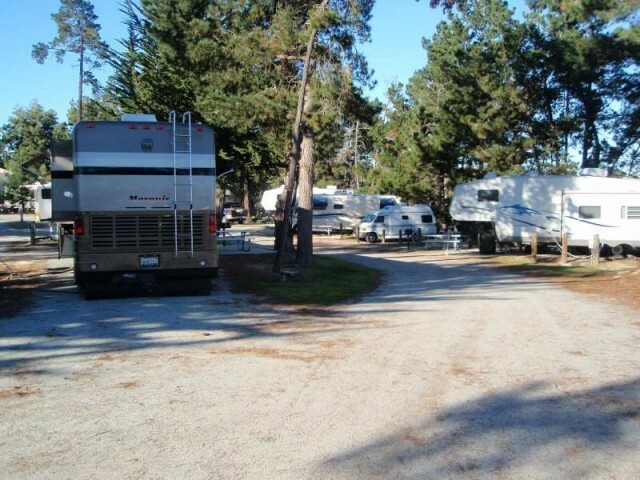 Free WiFi at the clubhouse and throughout most of the RV Park. Modem hookup behind the phone at the restrooms/laundry room. 2 pet limit with usual leash and clean-up rules. The length of stay policy is one month and then two weeks out before staying another month. During off peak times the month may be extended if there is availability and the General Manager gives approval. Only 2 sites have 50amp, the rest are 30amp electric. Overflow available only if FHU sites are full. RV office is in the back of the pro shop at the Golf Course. A popular place to stay while touring the local area and San Francisco, CA. You can't beat the location! Close to everything Monterey Peninsula. Bathrooms were immaculate, plenty of washers/dryers, and other than the early morning flights out of Monterey Regional, it was very quiet. The camp host was fantastic! My only complaint is the size of the lots. My 34 foot 5th wheel took a look of maneuvering to get into space #33 - we could have used a bigger spot and one was open close to us pretty much the entire time we were there. I thought the price was reasonable. But I go back to location and you can't beat if. I will stay here again. 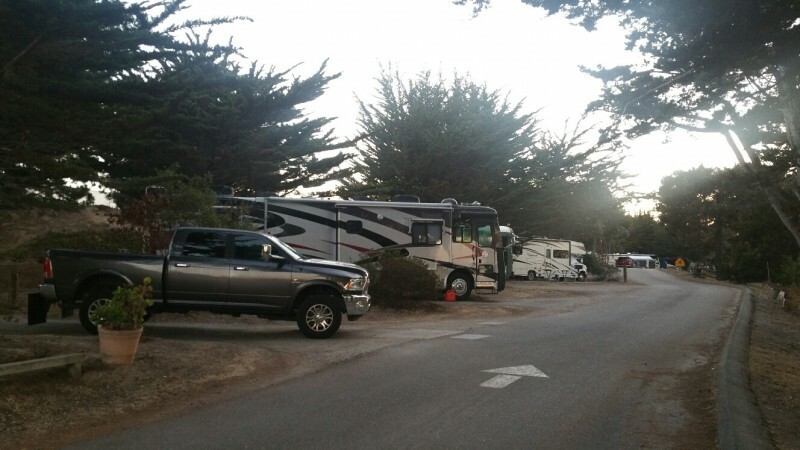 What this campground has going for it is location! 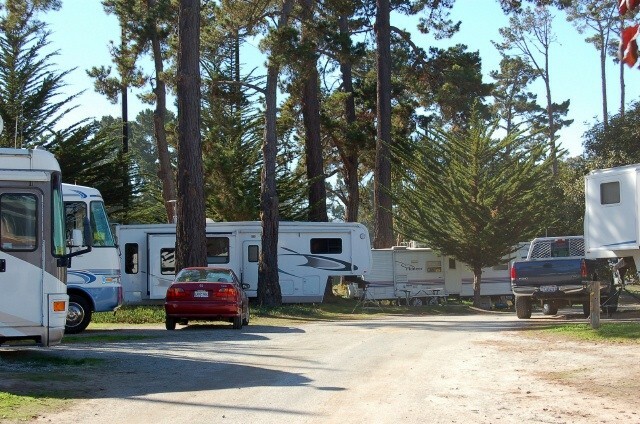 It is right in the heart of Monterey giving outstanding access to local sights and activities. Otherwise the campground is rather average, and a bit over-priced. 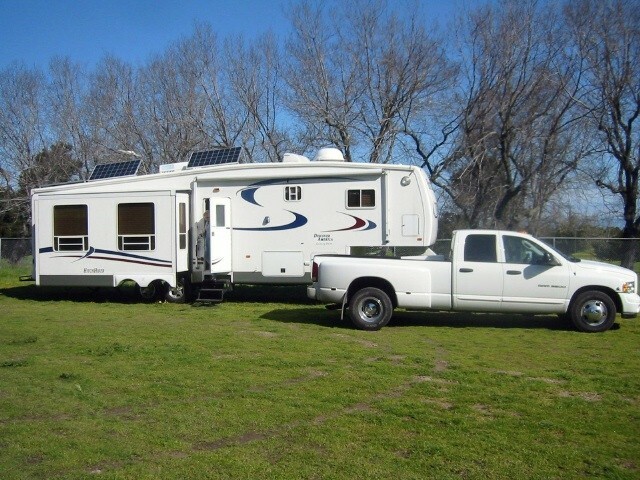 Most RV sites are short in length and our site required some creative leveling. Since it is surrounded by a golf course, I noticed some sites were within range of stray golf balls. 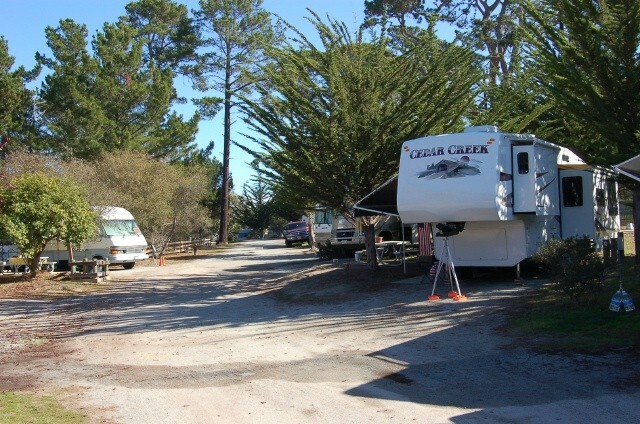 Also the campground is situated next to the commercial airport and under the flight path of the main runway. Expect daytime aircraft noise, both landing and take-off. Seems no traffic at night however. The bathhouse was clean and heated, and had clean showers – nice to have a warm bathhouse for showering. If arriving after hours/sunset, call ahead to get security code for gate! No problem getting to RV park, did research on Google maps before hand and that helped with the final approach details. Awkward tight turn when coming from west, if really big rig be prepared for turn and gate entrance. Concur with other comments about cost of this campground and quality of sites. If it weren’t for proximity to Monterey then not really worth the cost to stay here. We did like our site and worked just fine for us but then we aren’t huge or require 50 amp service. Campground is right at the end of the regional airport and can hear aircraft noise occasionally, not excessive. Didn’t hear any aircraft late at night. Noticed neighbors don’t observe the dogs on lease rule. Wi-fi worked fine for us, does slow in the evening. Problem last night…security gate would not open. 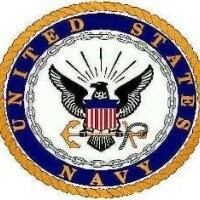 Called the emergency number posted on gate and finally got in touch with a sergeant at the Naval Postgraduate School. He was to call someone to come over and help. After about a half hour wait someone was exiting the golf course/RV park (gate automatically opens for exiting traffic) and the three vehicles now lined up trying to get into the RV park all went in the exit gate. Don’t know if anyone ever came to fix the gate. Sure expect better for the cost of this facility. Not intending to bash the Navy but really does seem like they charge more than what the other services do. A little hard to find and get to the entrance, but worth it. Although my reservation was for 7 days with 3 moves, (office staff was very helpful to get me in), I was able to arrange a deal with another patron that allowed me to stay in one spot the whole time. The County Fair was going on the week I was there, so the driving range was not available during that time as they were using it for parking for the Fair. Monterey is a great place to visit and see many local attractions, such as the Monterey Bay Aquarium, (just be prepared to hunt and/pay for parking). 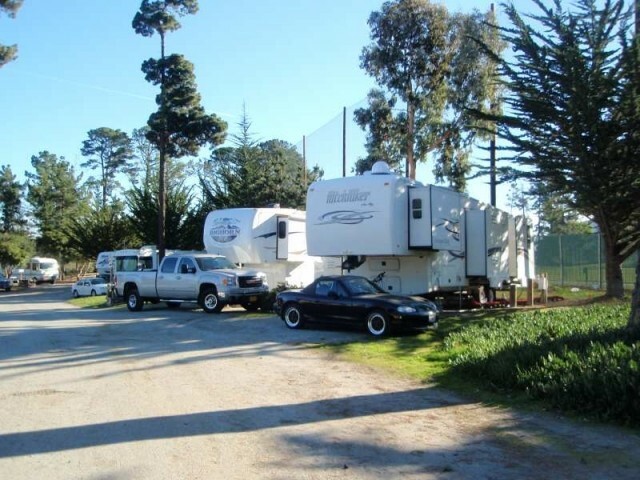 Didn't get around to taking advantage of the Golf Course, but the RV Park is literally right next to it, in fact you drive through the Golf Course to get to the RV Park. Fort Ord exchange is just a few miles up the HWY and the Naval Postgraduate School has a small exchange and gas station. All in all a great value and proximity to all your needs. Hope this helps, safe travels. So, why is "cleanliness and hospitality" above linked in same rating? Two different things definitely. We have stayed here a couple of times in the past. The bathrooms are spotless. The laundry is well taken care of and there's even a grill onsite. The sites vary from nice 40' sites to much smaller sites. Trees are abundant but can make satellite reception a big pain. Availability of these sites is online and there is an 800# to book the sites. We knew from past experience that we wanted a 40' back-in because those sites were on the south side with open skies for the satellite tv reception. After checking several times a day for a 40' site to become available, one finally was open. I called and made reservations for 3 nights for that specific site. However, that didn't mean my reservation was honored. About an hour out of arriving I received a call from the office indicating she was moving us because we weren't 40' and someone (after us) needed that site! What?? We were given a much, much smaller site and our credit card had already been charged!!! It was a weekend and you can imagine how difficult getting another spot at the beach in California would be over the weekend --- impossible. So, we jack knifed into the site given us -- probably the most difficult site we've ever pulled into. Upon checking in, prepare yourself for a lecture of the rules. We're all used to rules but this was a little ridiculous. Once away from office staff, we found the camp host super nice. She was friendly and helpful. Maintenance staff was also friendly. We do like the park. The location is fabulous but not so sure we would trust office staff to honor our booking in the future. The staff is great and very flexible to satisfy your needs. 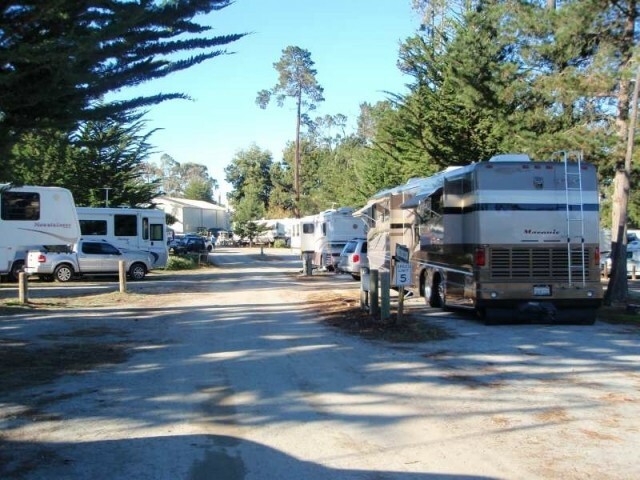 This RV Park is all about the Monterey area. So much to do it was easy to stay here for several weeks and remain busy every day. Unfortunately, it is near the runway of the Monterey Regional Airport, so there will be aircraft noise. In addition, the golf course lawn equipment start operations early in the morning, so that is noisy too. However, these two noise issues are easy to accept when you experience the convenience and beauty of this area. The Wifi was great and operation was consistent and reliable. We camped in a motorhome and will return. This is a great location so I can overlook some of the obvious flaws, which are simply that this is an outdated camp. If there were more 50 amp full hookup sites, and if the sites were regraded to make them more level, it would go a long way to improving the overall experience. 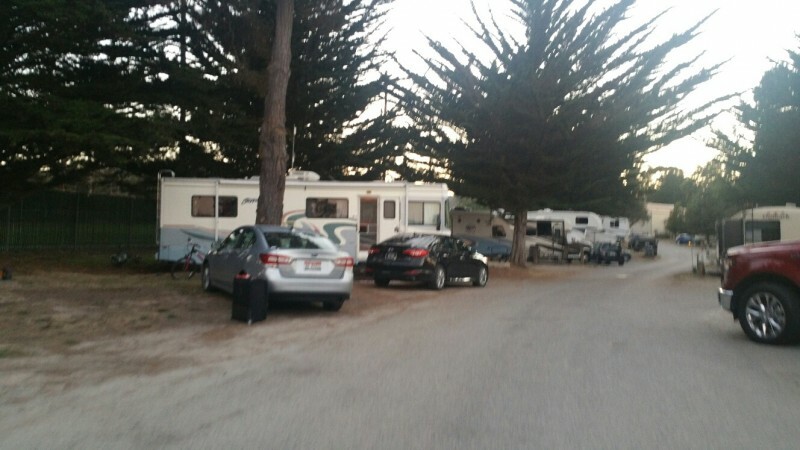 The space between sites is fine for short term stays, and this is not a typical parking lot RV experience as there is plenty of green around in view of your spot. The access to the Monterey Peninsula is the greatest asset here. Coupled with very helpful staff and Exceptionally Clean restrooms and showers, it is a win/win for me. I also appreciate that a short drive up Hwy 1 there is a commissary & exchange on Ft Ord that is easy in/out access. 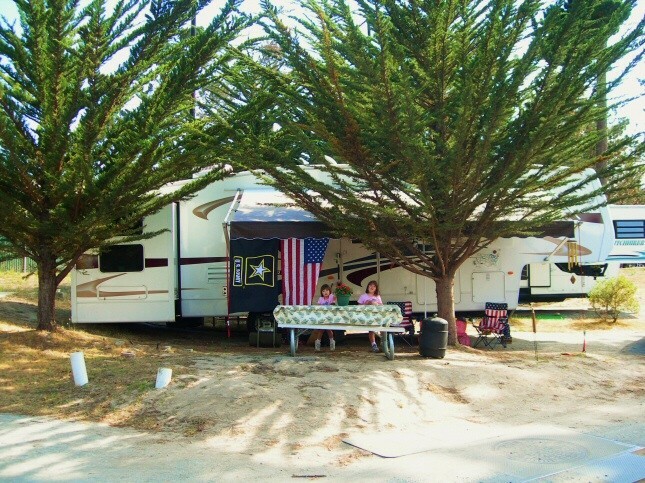 Great location and campsite host go hand in hand in a famcamp. Good shade and utilities in all campsites with very clean restrooms. Great LOCATION! Access to Monterey area and all it entails. 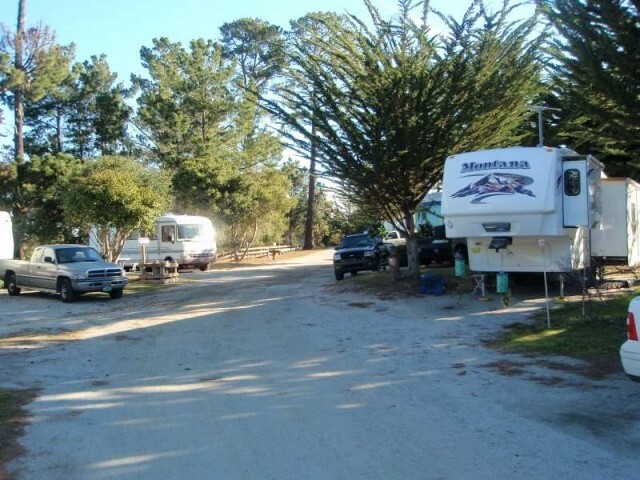 Small quiet campground with great shower and laundry facilities. Nice trees/shade on a beautiful golf course. Once in awhile the errant golf ball finds it's way into the campground. Spaces are fairly tight but most can handle 40' RVs/5th wheels if you're good. Only 30AMP but not a problem since weather is rarely too hot. Price has changed last year, FYI. $29 a night for water and electric only. Great hospitality and professional staff. Highly recommend the area...Cannery Row, Carmel, Big Sur, and the lighthouse. Monterey is a clean town that feels safe to drive through. Be sure to visit the Naval Post Graduate base and the Presidio, especially of you need gas without feeling like you've been robbed for using a credit card for gas. We really enjoyed our stay at the pines. The front desk staff and camp host were extremely nice. 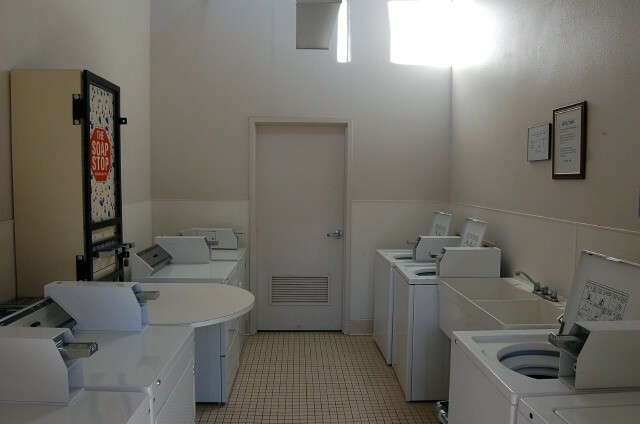 The facility, while not on a "base", was secure and quiet, laundry was reasonably priced and the bathhouse was great to have as well. Great location close to touristy things but nice to get away from the traffic and crowds. We will return! Thank you!!!! Information on the campground seems to indicates all the spaces have 50A service. I haven't found any 50A spaces yet, but haven't checked them all. Since my space doesn't have 50A plug I have to run the generator to dry clothes. 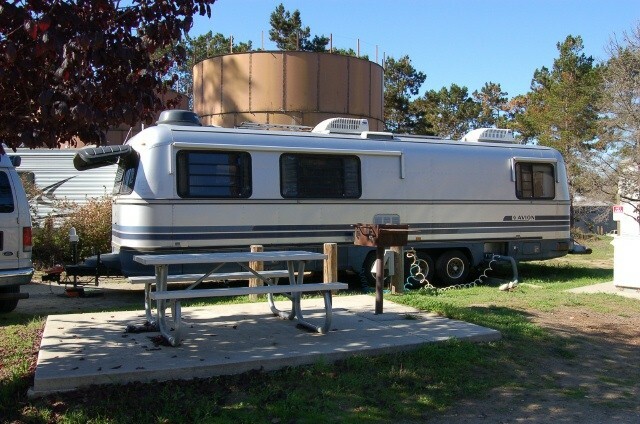 Very disappointed, you drive into a lush well kept golf course, you check in with the friendly golf staff then you drive around well kept grounds into a outdated, uneven, small, unkempt RV park. The trees intrude into the sites, the tables and grills are behind you, the ground slopes up to the sewer in some cases. Even with blocks I could not get my 38 foot RV level. Large rigs should just stay away. Cost is at the upper end of what I have been paying, but the facility needs major upgrades. Obviously the golf course is the priority, even the grass/weeds were not mowed in a week. 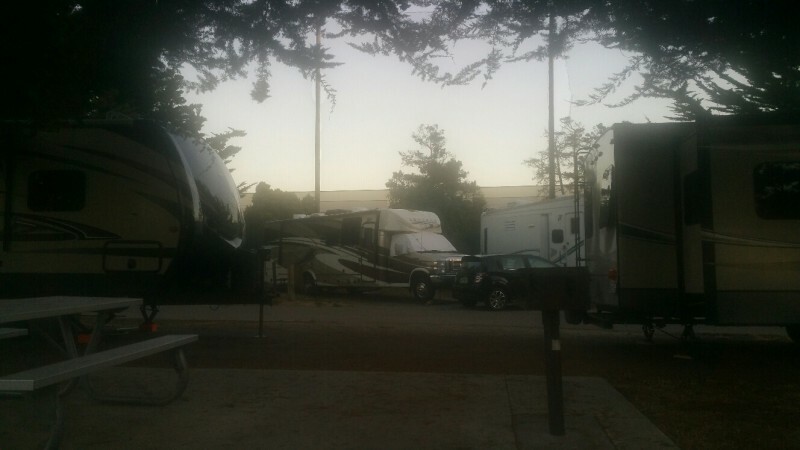 Great to see Monterey, but not on my list to come back, not worth the money unless you have maybe a 25 foot unit. Location is fantastic! Sites are small and dusty but this is Monterey. 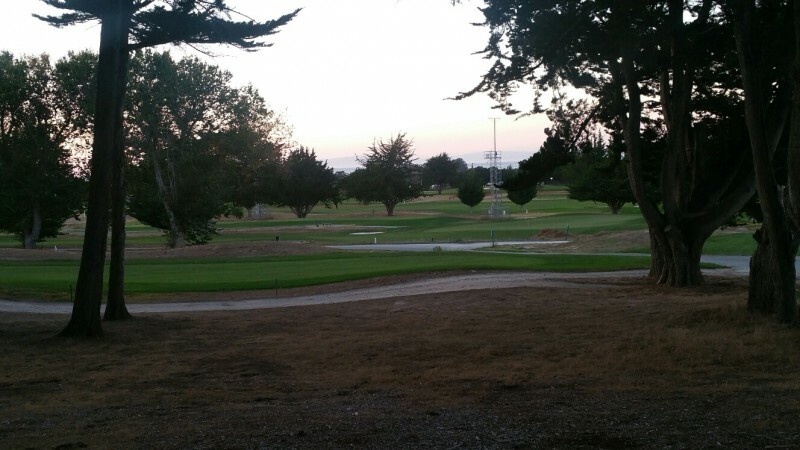 Airport is loud but not too busy and the area outside of the Golf Course is a little seedy at times, depending on what is going on at the Monterey Fairgrounds, located next to the golf course. Prices have been increasing but still less than other local parks though amenities are better at other parks. Stayed here for two weeks.nice location to see sites in area and to lots of beaches. Restrooms needed cleaning. Grass needed to be cut in campground area. Noisy golfers and airplanes. People don't clean after pets. We stopped here on short notice on a Saturday evening and went into the golf course club house. The gentleman was cleaning up and was very helpful. He called the camp host and she said she had a couple of open spaces. Lucky. This is nice little park and would be ideal for golfers. 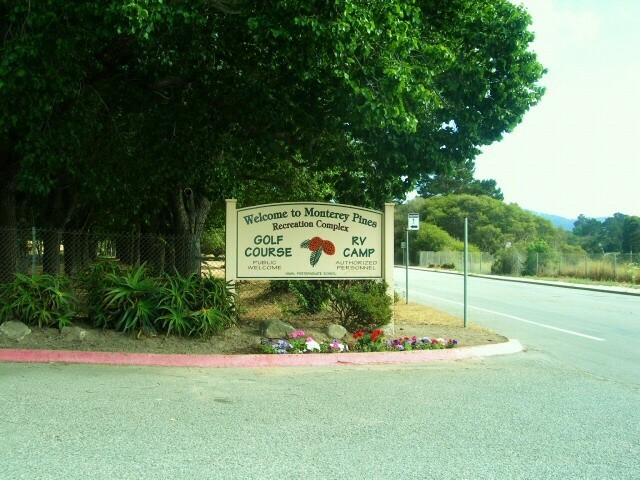 You walk to the Navy course and you are on the doorstep for all the Monterey Peninsula golf courses. 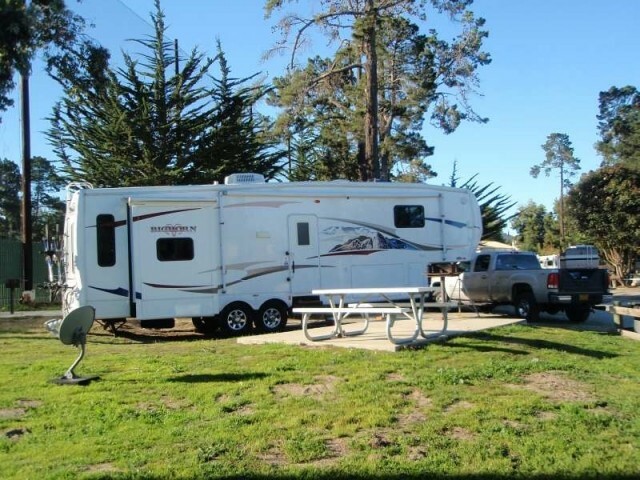 This park is convenient to all things Monterey has to offer. Quiet for the most part. A few families but this is not a retirement village. We will be back!! From the previous reviews we were hesitant but after staying there it was an awesome experience. Location was close to Fishemans wharf, Oulet Shopping, only an hour from San Jose. 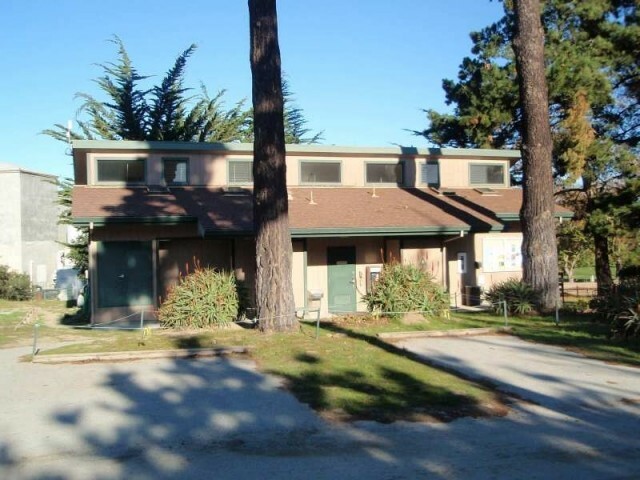 Close to Navy Exchange and Bx at the ole Fort Ord. Plan to return in August 2016. Idea for visiting many California spots within an hours drive.